At SVS Fine Jewelry we offer a FREE Nationwide Warranty on our finest jewelry pieces. We are honored members of Preferred Jewelers International. As members we service any warrantied piece for FREE! Even if you move clear across the country our warranty has you covered! There are Preferred Jewelers all over the United States! Some stores charge for a warranty but we believe as your jeweler we need to stand by our product and make it as easy for the customer as possible! Workmanship and materials of your jewelry are fully guaranteed. 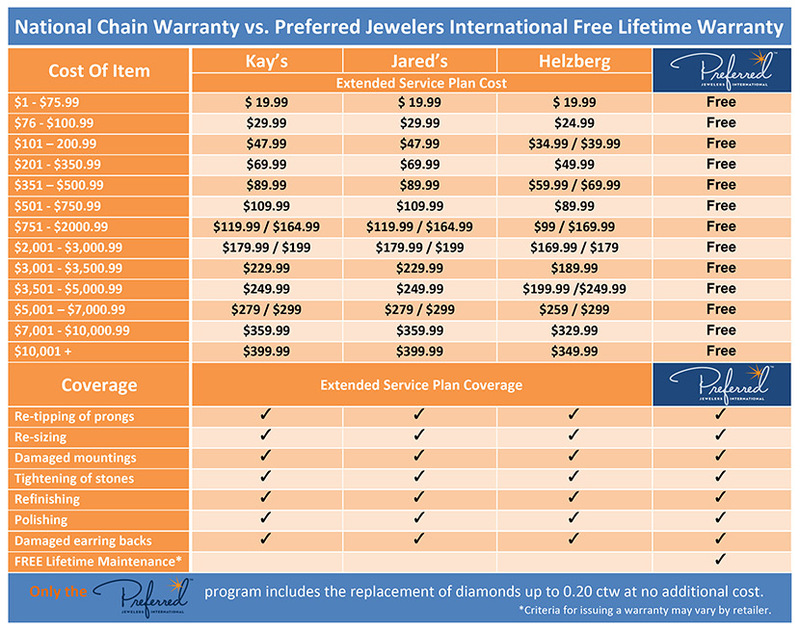 If service is required simply go to your Preferred Jeweler and it will be repaired and serviced at no charge. Moving? Don't worry about sending your jewelry back to your Preferred Jeweler to be serviced or finding that same excellent service in your new city. Just click here to find the nearest Preferred Jeweler in your new city! They will be happy to help you maintain the beauty and longevity of your jewelry. If you happen to move to a new location where there is no Preferred Jeweler near you and you need service, please contact the Preferred national headquarters. The toll free number is 888-998-8874 and we will advise you on how to proceed. What Happens if a ring has withstood major duress, for example if it has been slammed in a door, is it still eligible for free repairs under the warranty? Any kind of personal accidental damage to your jewelry would not be covered under the Preferred Warranty ... the warranty states clearly what is covered and hence the requirement for the semi annual inspection to keep your piece in warrantable condition. If this should occur the retailer will charge you to get your jewelry back in warrantable condition and then reinstate the warranty. Private Insurance coverage is highly recommended and we can recommend carriers.